Thanksgiving Presents: Quilted Pillows | Sparkle On! When I saw the quilted pillow cover Merry and Bright by Amy Sinibaldi of Nana Company, I loved it and decided to make two, one for my sister and one for my mother. I rushed to have them done by Thanksgiving so I could give them as pre-Christmas gifts. The patchwork squares are 2 x 2” with a finished pillow form size of 12 x 16”. The script is hand embroidered. Both have an envelope back. The fabric is from the “English Tea” collection, a 10” stack I bought from Connecting Threads, with the exception of one square in each of a a cute vintage reproduction Santa fabric from Joann’s. It’s discontinued and I only have a few Santa’s left for fussy cutting. For my mother’s I added some buttons. On Anne’s I planned to use a pom-pom trim until…. …she sent me this picture of their newest family member; kitten Theo with his pom-pom. So I picture this cat demolishing the pillow and decided to go with Plan B, a discrete crochet trim. I like it! Darn, those pom poms would’ve been cute, but probably not for long! Good idea to switch to the crochet! Cute project! These pillows are such sweet gifts! The message is embroidery and the hand quilting make them very special. Haha, thanks for the chuckle on Secret Santa! So glad Theo has approved of your gift! Thanks Cindy! So nice of you to say😊I think they thought it was special too. These pillows are beautiful. I love the crochet trim…makes it look classic. Thank you so much! Theo is irresistible! I just love my new heart pins 💕 It was a shame to have to take them out….that gives me idea to find some pearly heart buttons, thanks! Great substitution! And the cat looks quite pleased with it! Thank you! I enjoyed making them. How adorable! So glad you go them done in time – it is a really sweet project. Love the kitty stealing a pom pom – they are cunning creatures! Good thing you saw it before you added the pom poms. I love the crochet lace instead. Thank you! It was a nice surprise gift for them. Cunning is the perfect word! I know her kitty would have done a sly and stealthy attack on a pom pom pillow! 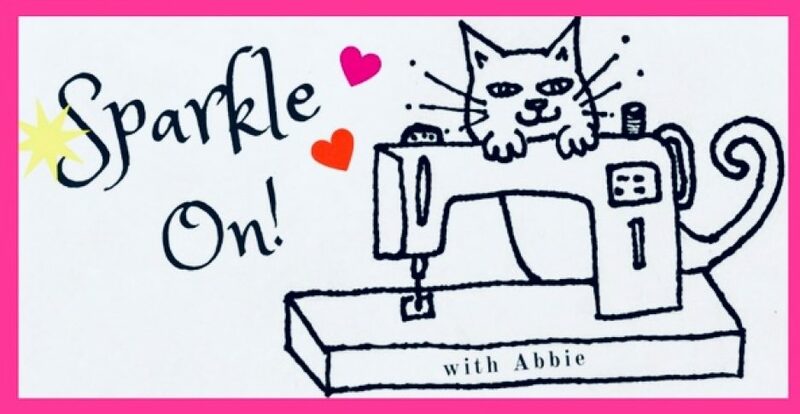 Abbie — I love the embellishments! Beautiful work! Theo with his pom-pom – such a cute photo! The pillow you made is wonderful and the crochet trim seamed like the best idea! Thanks! I think sister would have preferred pom-poms but I did have to take a Theo into account! Oh, I believe you made the right choice of trim. LOL Cats! Have to love ’em.